Ensuring some serious sparkle for her weekend nuptials, Natasha Bedingfield enlisted the help of jeweller to the stars, H. Stern, to bring some bling to her big day. And though the nuptials may have been sweet and simple, when it came to the jewellery, Natasha opted for intricate and opulent, with pieces that screamed luxury. To walk down the aisle, Natasha teamed her Vera Wang dress with a dazzling necklace from the H. Stern’s sumptuous Nature collection. Inspired by the complex shapes of branches and leaves, the style was set in 18k Noble gold and featured a gittering array of diamonds. 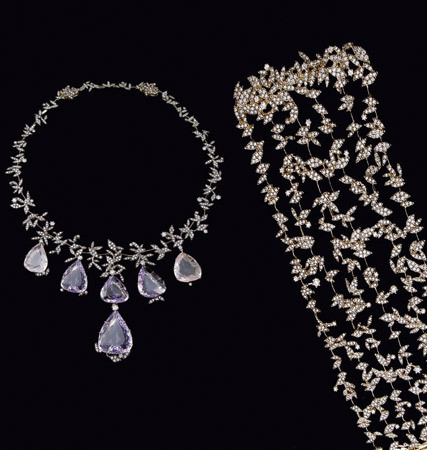 Dangling from the design were droplets of lavender amethyst and rose quartz. Onto the after party and the bride added H.Stern’s 18k yellow gold Stern Brilliant earrings, which featured almost 13 carats of diamonds.